Following a year of attacks on indigenous peoples in Brazil, protests are expected in Brasilia as the Supreme Court decides on the future of indigenous land rights. On the 16th August thousands of indigenous activists are expected to march on the Brazilian Supreme Court as it rules on the fate of three indigenous territories. The Supreme Court will decide whether to accept a new definition of traditional land rights as “marco temporal”, which would restrict the claims of indigenous people to just that land which they have continuously occupied since 1988, when the so-called Citizen’s Constitution was written. This follows months of appeasement of the right wing ruralista front by the Temer government in an attempt to hold on to power – the lobby has previously called for the closure of the Indian Affairs Department, FUNAI. 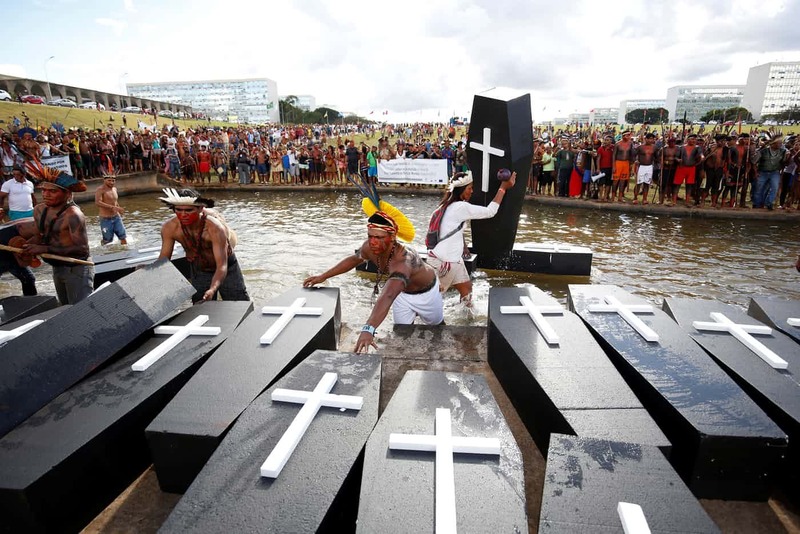 In April over 2000 indigenous activists protested in Brasilia calling for the demarcation of their lands and an end to the wave of anti-indigenous violence, which included the killing of 22 Gamela Indians in the state of Maranhão. These attacks on environmental defenders have been spearheaded by landowners that represent the interests of global capital including agribusinesses such as Syngenta and Cargill. If ‘marco temporal’ is instituted, people such as the Guarani Kaiowá, who have already been stripped of the majority of their lands in south-western Brazil, will be unable to fight in the courts for the reclamation of their land. This ruling would also go against international legislation (ILO 169) that demands “particular attention” to the situation of nomadic people who, by their way of life, have not continuously occupied any land since 1988. Eliseu Lopes Guarani Kaioawá of the Articulation of Indigenous People in Brazil warned last week that “if the marco temporal is approved, the massacres, the spilling of blood, the genocide, the evictions that we are suffering in our lands today, will also be approved”. Last week, 48 indigenous and civil society groups released a statement calling for an end to criminalisation, violence and violations of their rights to free, prior, and informed consultation as well as justice for those fighting these attacks. These threats to indigenous land rights come at a time of increasing deforestation in the Amazon and political instability as Michel Temer clings on to power despite an approval rating of just 2% by allying with what radical anthropologist Manuela Carneiro da Cunha has called 'the BBB front’ (the Beef, the Bible and the Bullet). The BBB front represents a convergence of political interests between agribusiness and the ruralistas, the pentacostal church, and those fighting for the right to bear arms.